I love finger foods. These wedges fill my need to use my hands to eat and leave me with a little salt left to lick off my fingers. I feel no shame in admitting this to you. The tapioca flour in the recipe is what helps these wedges get crispy on the outside & stay soft on the inside. The other key is using a minimal amount of oil. Too much oil yields a mushy potato. It's also super important not to crowd the pan so use more than one cookie sheet if needed. These are really great as a side to just about any dish. They're especially good with some paleo lettuce burgers. 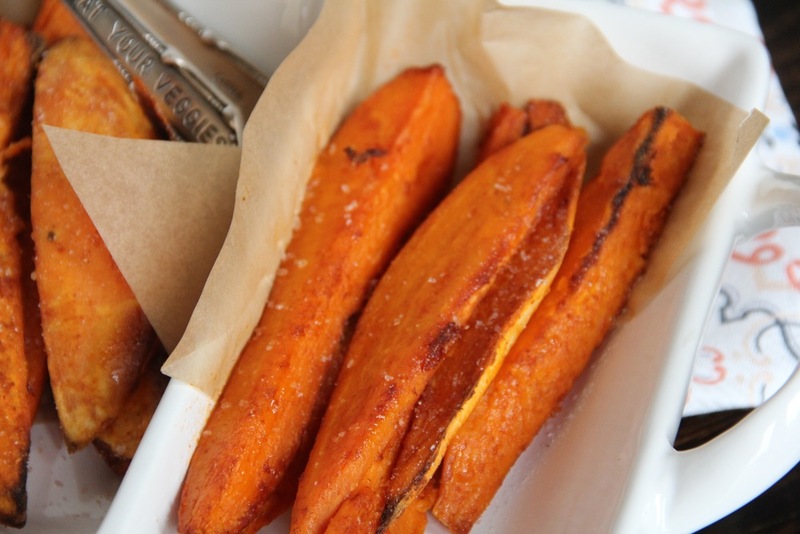 I hope you enjoy these Sweet Potato Wedges as much as I do. preheat the oven to 425º. cut the potatoes into long wedges that are about 3/4" in width. place the potato wedges in a large glass bowl & then pour the olive oil over them. toss & make sure all the potatoes are coated with oil. place potato wedges in a single layer on a cookie sheet. use more than one if necessary - do not overcrowd the pan. bake 15 minutes per side & then broil on high 2-3 minutes to finish browning. generously sprinkle freshly ground sea salt over potatoes as soon as they come out of the oven. enjoy immediately! © 2016 the nourished body and soul. All Rights Reserved. Design by laura lee blackburn.